Lucky for dogs everywhere, there are a growing number of animal advocates, rescuers and activists throughout the world fighting on behalf of man’s best friend. But not everyone is willing to risk life and limb – or come face-to-face with one of the planet’s most violent forms of animal cruelty – in the process. Enter Marc Ching, founder of the Animal Hope & Wellness Foundation and owner of The PetStaurant. A holistic pet nutritionist and Japanese herbalist by profession, this incredibly brave rescuer has taken it upon himself to save as many dogs as he can from the Asian pet meat trade. Ching’s harrowing odyssey into this dark underworld began last May, when he learned about the summer solstice lychee and dog meat “festival” in Yulin, China. Shocked and disbelieving that such an inhumane practice could actually exist in the modern world, Ching bought a plane ticket, grabbed a backpack and headed to China with a raw determination to witness the trade for himself and rescue as many dogs as possible. This is Marc Ching – rescuer, savior and modern-day hero. These poodle pups were rescued from a trash bag. Photo courtesy of Animal Hope & Wellness Foundation. Since that first fateful journey, which shook him to the core but also galvanized his resolve to keep coming back and save more dogs, Ching has made three additional trips, rescuing a grand total of 249 canines from some of the worst and largest slaughterhouses in notorious dog meat locales including China’s Guangzhou province; Busan, South Korea and Hanoi, Vietnam. Unfortunately, only 61 dogs survived their ordeal. A slaughterhouse in Hanoi, Vietnam, a city notorious for its incredibly violent meat trade. Photo courtesy of Marc Ching. As the founder of a nonprofit focused on rescuing, rehabilitating and rehoming severely abused dogs in the U.S., Ching is no stranger to cruelty. But he admits his rescue missions to Asia have come at a cost both mentally and physically – he’s been beaten, held hostage, had a machete put to his throat, a gun at his head, and lives with visions that will haunt him for the rest of his life. But neither mental anguish nor fear of death has deterred this gentle savior from his quest. Since that first fly-by-the-seat-of-his-pants trip to China, Ching has developed a more organized process that includes travel itineraries, securing translators and veterinarians in advance, working with teams of researchers to locate slaughterhouses, and finding ways to obtain undercover video footage – without getting caught (he was beaten severely when a South Korean butcher caught him wearing a GoPro). Posing as a wealthy American dog meat buyer, he makes a point of never going to the same slaughterhouse twice. Marc with Hope, the first dog he rescued from a slaughterhouse in China. Hope has since recovered from his injuries and has been brought back to the U.S., where he serves as an ambassador for Animal Hope & Wellness Foundation’s China Effort. He is indeed a miracle! Photo courtesy of Marc Ching. For those unfortunate dogs who don’t make it to the vet, Ching makes a point of driving them into the countryside and giving them a dignified burial. “At least they knew in their last moments that someone cared for them,” he says. Despite the unspeakable horrors and mental anguish he has endured along the way, Ching insists his Asia efforts are worth the pain and sacrifice, especially when he’s able to fly dogs to the U.S. and bring them to his foundation in Sherman Oaks, Calif. So far, Ching has brought back 46 lucky dogs, most of which have since been rehabilitated and adopted into loving homes. These puppies were rescued from a slaughterhouse in China. It is unthinkable that anyone would want to harm such innocent beings. Photo courtesy of Marc Ching. Ching says one of his most special rescues is Sorrow, a black and white French bulldog he saved within minutes of being brutalized in a slaughterhouse in Tongzhou, China. Sorrow just moments after his rescue. Photo courtesy of Marc Ching. Rescuing and getting treatment for dogs in other countries, especially those with extensive medical needs, can be incredibly costly. As the saying goes, “if you want to help animals, get rich.” Luckily, Ching’s thriving wellness and nutrition-centered pet store, ThePetStaurant, has enabled him to fund his Asia missions without having to rely heavily on donations, although he always appreciates any help he can get from his passionate supporters. Ching’s purity of intention is also reflected in the beautiful, tragic, yet inspiring writings he posts on Facebook and Instagram before, during and after his missions. Writing has essentially become a therapeutic outlet for Ching, who admits he has been deeply traumatized by what he has experienced. Yet besides helping him to heal his heart and mind, his heartfelt, sometimes gut-wrenching posts have also touched the hearts of thousands of animal lovers throughout the world, devoted social media fans who follow his travels and cheer him on, every step of the way. Marc on the back of his translator’s moped in Hanoi, following a near-death experience at a slaughterhouse. Photo courtesy of Marc Ching. But after staring into the jaws of death one too many times, this devoted husband and father of two has begun to rethink his strategy, from one of rescuing to shifting a mindset that will inspire lasting change. At the core of this new strategy is a media campaign in China and South Korea that will feature a short documentary tempered with graphic undercover video footage Ching and two undercover slaughterhouse workers have compiled over the last several months. Dubbed “The Compassion Project,” its intention is to shed light on the abusive practices tied to the trade, turn people away from eating dog meat and support change. Marc with a very grateful Bull terrier he rescued from Li Yuan, China. The kisses make it all worthwhile! Photo courtesy of Marc Ching. Meanwhile, Ching is about to embark upon a fifth mission, this time to Thailand, Cambodia, northern Vietnam, South Korea and Yulin, China, a trip he expects to be his “most intense yet.” It appears there is no stopping this determined rescuer. Sorrow snoozing with his foster brother. He is back in the U.S., doing great and already has several prospective families vying to adopt him! Photo courtesy of Animal Hope & Wellness Foundation. When a human being bears witness to terrible atrocity, they are forever changed. I can attest to that, just from researching and writing about the dog and cat meat trade. So when I tell Ching he is my hero, that I could never do what he is doing, that I am so grateful that there are people like him in the world, willing to do whatever it takes to make a difference in the lives of animals, he just laughs. To learn more about Marc Ching, read his incredibly heartfelt writing and find out how to support his efforts, check out the Animal Hope & Wellness Foundation website and Facebook page. Ching cradling Sorrow before heading to the vet. Many dogs that end up in the Asian dog meat trade are lost or stolen pets. Photo courtesy of Marc Ching. Picture this: you’re an international animal rescuer and welfare advocate, tasked with documenting one of the most egregious forms of animal cruelty on the planet – the dog and cat meat trade. You’ve arrived in Yulin, China, a sub-tropical city located in the Guangxi province, a notorious hotbed for pet meat consumption. It’s your very first trip to this magnificent country, but you won’t be doing any sightseeing. Instead, you’ll be attending the city’s 5th annual summer solstice lychee and dog meat “festival,” a barbaric event held every June that attracts thousands of people seeking to celebrate the season by feasting on heaping plates of dog meat and lychee fruit. As a 20-year cruelty investigator and front-line rescuer in the U.S., you’ve seen your fair share of brutality against animals, yet you know that what you’re about to witness is the stuff of nightmares, visions that will probably haunt you for the rest of your life. But you must put your emotions aside. Your mission is to document what you see and bring it to the world while supporting Chinese activists fighting to end the festival and the trade. 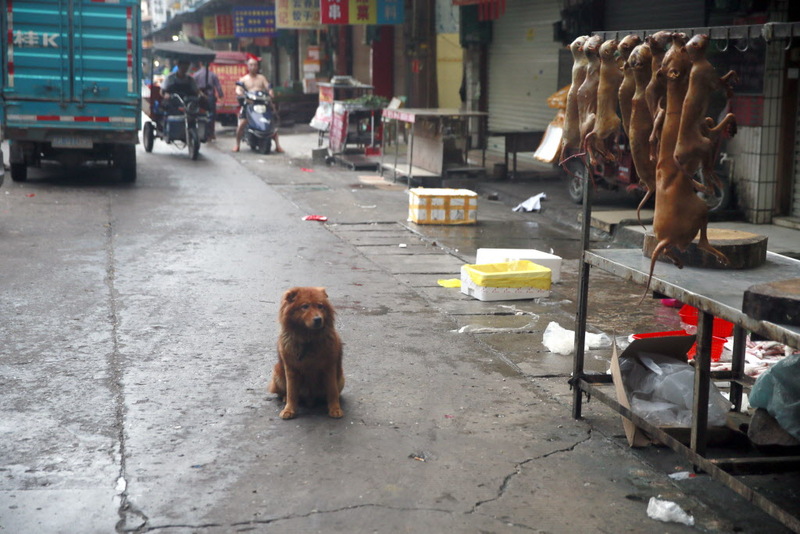 You’re Adam Parascandola, director of animal protection and crisis response for Humane Society International, and this is the story of your experience at the Yulin dog meat festival – the good, the bad and the very, very ugly. 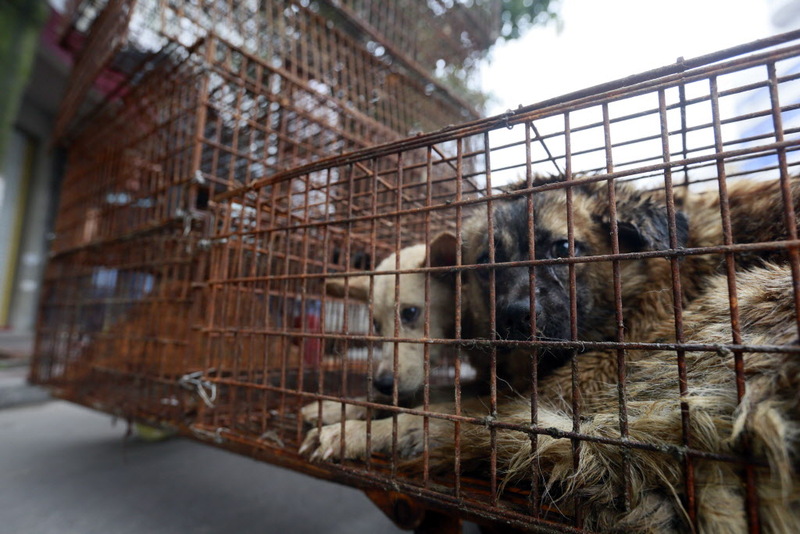 Caged dogs sit on the side of Renminzhong Rd., waiting to be transferred to a slaughterhouse in a narrow alley. Photo credit: Humane Society International. It was 3:30 in the morning on June 22, the opening day of the festival. Tipped off by activists that a large truck has arrived at Dongkou Market and was unloading dogs at one of the slaughterhouses, Adam and his cohorts – a Chinese activist, an AP photographer and a New York Times reporter – raced to the scene (read the compelling NYT article here). In an attempt to throw off animal activists who have been protesting the festival with increasing fervor each year, the Yulin government had instructed butchers to go from slaughtering dogs out in the open during the daytime to concealing their gruesome activities under the cover of darkness or behind closed doors, Adam explained. 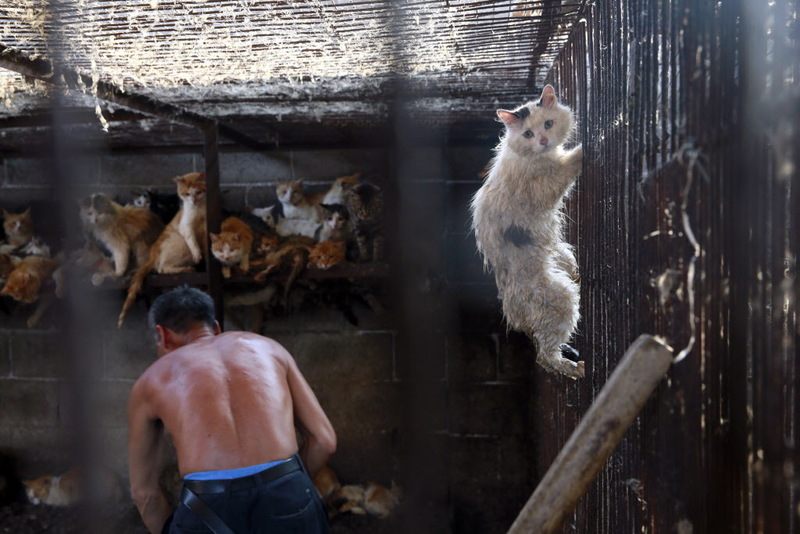 A cat climbs up the cage at the slaughterhouse, trying to escape. This cat was later rescued by Peter Li, HSI China policy specialist. Photo credit: Humane Society International. At this point in our interview, I just had to ask – how does he do it? How does someone who loves animals and has dedicated his life to helping them emotionally handle such horrendous cruelty and suffering? As the day progressed, Adam and his team – now joined by local and international media and activists from Vshine Animal Protection Group – continued documenting the festival while making sure to move together as a group for safety reasons. While some butchers expressed their displeasure at being filmed by throwing boiling water at the activists, Adam said he never felt that his life was in danger. As a foreigner in a city not accustomed to international travelers, if anything he felt like more of a curiosity than an object of anyone’s vitriol. 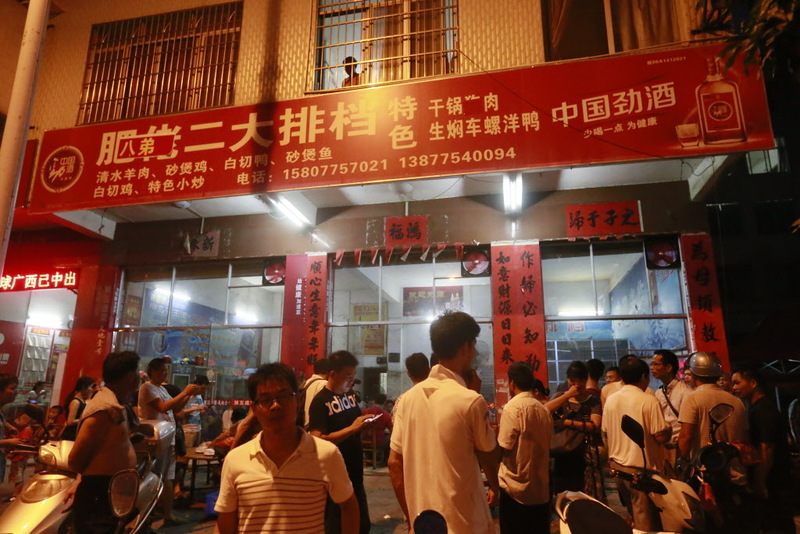 Diners waiting for a seat at one of Yulin’s dog meat restaurants. Photo credit: Humane Society International. And for an animal lover, that market was pure hell on earth: thousands of ill-fated dogs and cats of all sizes, ages and breeds languishing in tiny, filthy cages, simply waiting to die. Whether by truck, bicycle or moped, most had been transported over long distances under horrific conditions and deprived of food and water, so they appeared stressed, traumatized, even sickly. Worst of all, many seemed to be former pets. Small dogs await their doom at a slaughterhouse. Photo credit: Humane Society International. 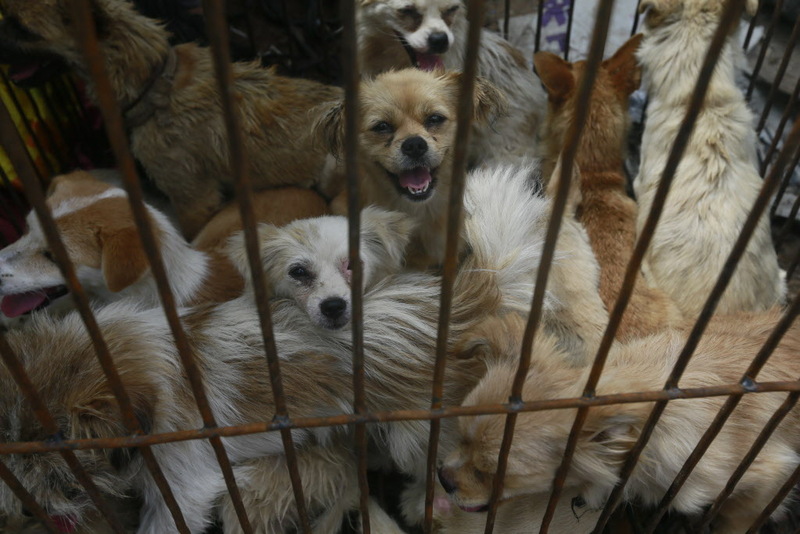 Although much of the country’s populace has turned away from the gruesome culinary “tradition,” it’s estimated that as many as 10 million dogs and four million cats are eaten annually in China. But as the divide grows between older generation dog meat traders and younger generation Chinese animal activists who want the trade to stop, clashes between activists and dog meat traders are becoming more and more commonplace, making events like Yulin a veritable battleground in China’s burgeoning animal rights movement. The good news is that this festival of torture may be on its last legs. For the past four years, domestic and international activists as well as animal lovers throughout the world have become increasingly vocal in their outrage and opposition to the gory event, calling upon the local government and the Chinese public to end dog and cat-eating in China and the cruel practices inherent in the unregulated trade. All that unwelcome global attention and criticism appears to have had an impact, reducing a once bustling event known to take the lives of 10,000 dogs and cats to a smaller, more subdued gathering with fewer traders, stalls and animals. 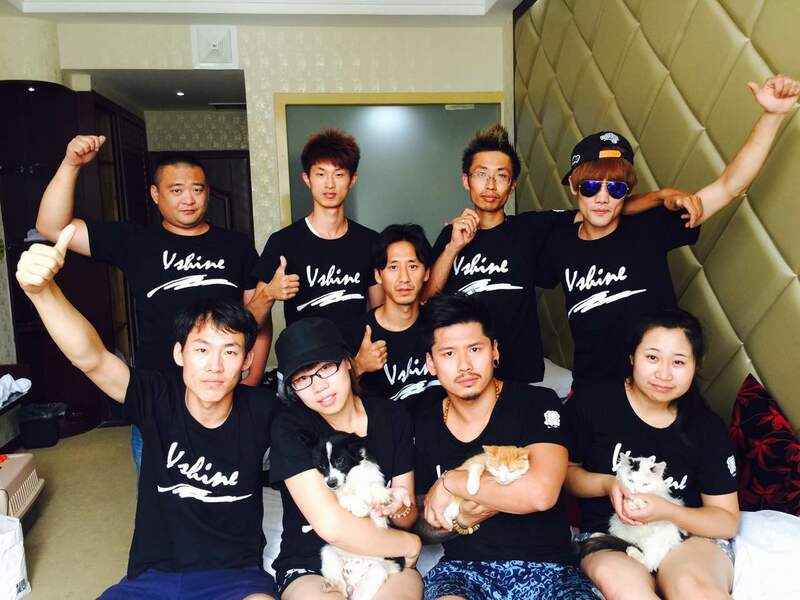 Chinese activists from Vshine Animal Protection Group in-action at Yulin. Photo credit: Humane Society International. Thanks to the magic of social media, much of that massive attention and condemnation was fueled by hundreds of thousands of animal lovers, including celebrities such as Ricky Gervais, flooding domestic and international social media sites with online petitions, awareness campaigns and messages condemning both the festival and the trade. Although Adam said he will never forget what he witnessed at Yulin, he has since been busy laying the groundwork for a more humane China. Just last month, he returned to the country to help HSI launch China Animal Protection Power (CAPP), a command center in Dalian, China that provides financial support and training for Vshine and other animal activists dedicated to intercepting, rescuing, sheltering and adopting out companion animals seized from meat trucks. 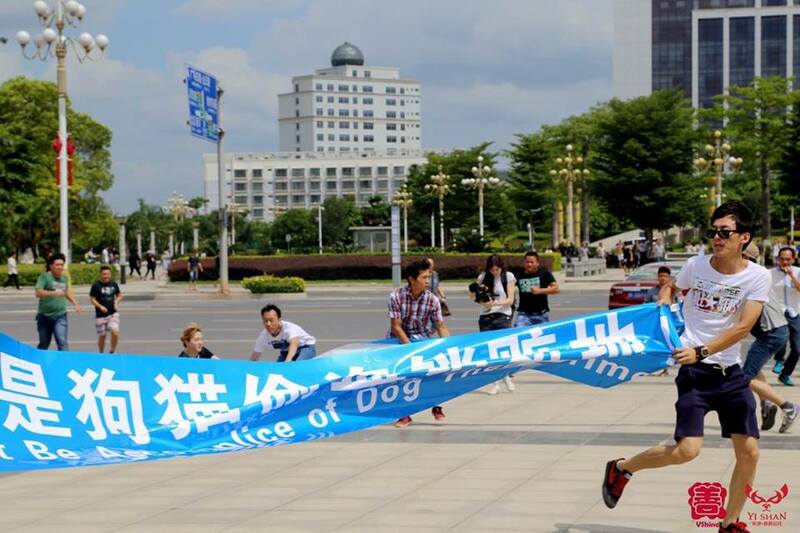 Since Yulin the task force has rescued more than 1,400 dogs, Adam boasted. Heartened by so many young and passionate Chinese citizens who have taken it upon themselves to challenge their country’s antiquated attitudes toward animals and improve China’s reputation as a developing and progressive nation, Adam said he does see a light at the end of the tunnel when it comes to the end of the pet meat trade. 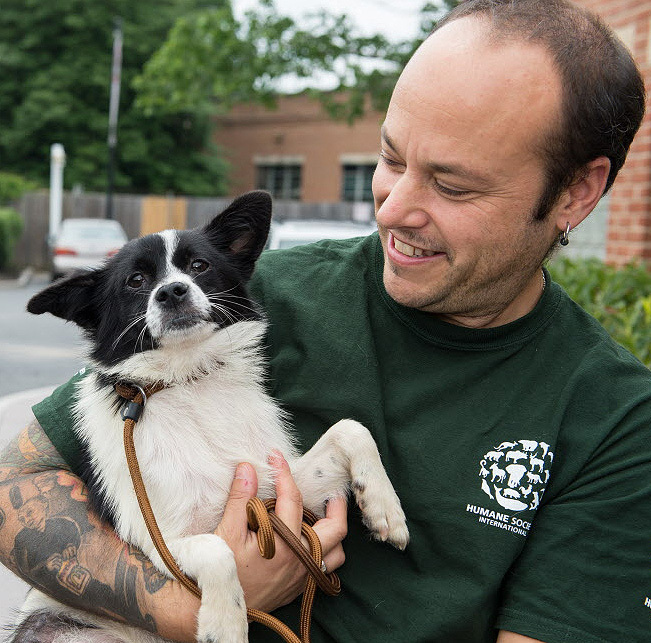 Adam with Ricky, a very lucky dog rescued by Peter Li from a Yulin slaughterhouse a few weeks prior to the festival. Ricky (named after HSI supporter Ricky Gervais) was later brought to the U.S. and Washington Animal Rescue League, where he was rehabilitated and adopted into a loving home. Photo credit: Washington Animal Rescue League. I certainly hope so. Human beings are slow to change, and those who make their living off the backs of animal exploitation aren’t likely to surrender their livelihoods willingly. So while I agree we may indeed see an end to the dog and cat meat trade in the near future, it won’t come without a long, ugly fight. Which led me to my next question – how does Adam stop himself from hating those people – not to mention entire cultures – who support and condone such heinous cruelty? Dog carcasses hung up for sale in Dongkou market, as a dog looks on. Photo credit: Humane Society International. I don’t know about you, but I’m truly grateful that we have incredible individuals like Adam Parascandola fighting the good fight in the effort to create a kinder, more compassionate world for animals everywhere. He is a true voice for the voiceless. Thank you, Adam. To learn more about the dog meat trade in China, check out this excellent CNN article. Want to see this cruel trade come to an end? Please support HSI and their incredible anti-dog and cat meat campaigns by visiting their donation page.